How important is it to buy organic clothes? Just what is ethical clothing, anyway? A long travel skirt makes sense in nearly any setting, as this Sympatico fan found out. I blog about sustainable fashion, earth-friendly fibers like hemp and Tencel, capsule wardrobes, travel wear, and related subjects. A well chosen skirt or two can make terrific travel wear or become essential elements in your capsule wardrobe at home. If you read this blog regularly, you know that I’m a big fan of casual skirts for travel. In fact, I recently put up a Pinterest travel clothing board here to help spread the word about skirts. But of course, with skirts it goes much further than that. A well-chosen skirt selection can become a core element in your capsule wardrobe; one that’s at home in a wide array of settings. In creating the Sympatico casual skirt lineup, freedom of movement is paramount. Comfort, both physically and socially is another consideration. I design my skirts with lengths intended to work in many different situations, including cultures where modesty is important. My longer skirts, such as the Curved Skirt and Angled Skirt, will appeal to anyone seeking sun protection or culturally-appropriate coverage. With a length that falls at mid-calf for many women, the Angled Skirt has simple, timeless lines that work in nearly any context. The Flip Skirt is for those situations where you’re comfortable exposing more leg. I designed the Flip Skirt in two lengths: a 20” version and a 24” version so you can find your own coverage sweet spot. Sympatico’s hemp and Tencel skirts are designed and built for the long run. Both fibers are very durable as well as breathable. They’re also easy to live and travel with. Roll up your skirt before packing it in your suitcase or bag. On arrival, hang your skirt up and spritz it with some water. Wrinkles will relax overnight, especially in humid conditions like a steamy bathroom. 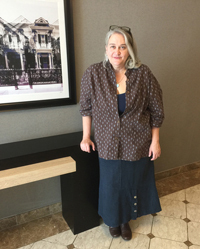 I make the Flip Skirt in two lengths: the 20” version falls just above the knee for average heights while the 24” version has a slightly below-knee hemline. The 27” Curved Skirt has a classic A-line and is slightly fitted with fullness through the thighs for easy movement. Whether you’re on the road or sticking close to home, you can take comfort in knowing that your Sympatico skirt is designed and crafted in the US with respect for both the people involved as well as the earth. Fair wages and true sustainability are values that go to the heart of why I began Sympatico. Having worked in the apparel industry for many years and witnessed it moving offshore, I was convinced there was a better way to treat our planet and fellow humans. Both the hemp and Tencel fibers used to make my fabric are raised without synthetic pesticides and fertilizers. Processing of the Tencel yarns is done in a closed-loop system that in part uses algae to break down the organic substances used in preparing the yarn for spinning and weaving. Virtually all these substances are recaptured. You can learn more about hemp’s advantages here, and the earth- and style-friendly attributes of Tencel here. As a micro business, I work with very small dye lots, and early on I made the decision to use low-impact, fiber reactive dyes to create the Sympatico color palette. These dyes minimize the environmental cost of creating textile colors. As much as I would love to use all organic substances to dye the Sympatico collection, that currently is not practical. You can learn more about the ins and outs of environmentally responsible fabric dyes here. Not certain which Sympatico skirt is right for you? I'm happy to offer shopping and sizing advice either by email or phone. I can be reached between 9 am and 6 pm Pacific Time at 541-899-3988. Does modest dressing oppress or liberate women?